The Treasury has launched a taxpayer-backed scheme to insure banks' riskiest assets against further losses. The scheme aims to clean up banks' balance sheets and to encourage them to lend more freely. 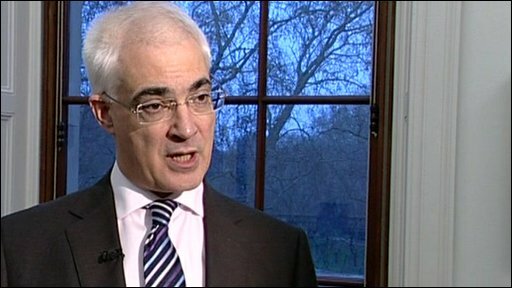 Chancellor Alistair Darling said the programme would restore confidence to the banking sector. RBS was the first bank to sign up to the scheme. It will put in £325bn of toxic assets. Lloyds said it would also take part in the programme. "We want to rebuild confidence and provide certainty to enable banks to maintain and extend their lending," Mr Darling said. "If we don't fix the banks, we won't fix the economy." Shadow chancellor George Osborne said that other government schemes to get banks lending again had not yet worked and demanded to know the extent of the total taxpayer exposure. "British taxpayers are insuring the car after it has crashed," he said. Banks that sign up to the Asset Protection Scheme will bear initial losses on the protected assets, with the government shouldering the remaining losses. In return, banks will also pay a participation fee and enter into legally binding agreements to increase the amount of lending they provide to homeowners and businesses. Taxpayers may become liable for about £500bn-worth of bad loans and investments. RBS will pay a participation fee of £6.5bn to the Treasury and has promised to lend £25bn in 2009 - £9bn of mortgage lending and £16bn of business lending. The agreement will mean RBS is liable for the first £19.5bn losses. Lloyds is expected to detail its terms when it releases its 2008 results on Friday. The Treasury said it would also inject £13bn of capital into RBS, on top of £20bn already announced, and make an additional £6bn available, should RBS need yet more capital. This could take the government's stake in RBS to 80%, Mr Darling said. "We will have shortly 70% of the voting shares, in other words we have a controlling interest. In terms of the economic interest, what is the taxpayer interest, the figure goes up to just over 80%, so we do have a significant holding in this bank," he said. British retail banks with more than £25bn in eligible assets will have until 31 March to join the Asset Protection Scheme, which will run for a minimum of five years. Investors welcomed news of the scheme, saying its terms were more favourable than initially thought. RBS shares were up 17% at 27.1 pence in afternoon trade, while Lloyds Banking Group climbed 24% to 71p. Barclays rose 6% to 111.6p and HSBC added 5% to trade at 518.25p.